Glyder Fawr, Wales’s fifth highest mountain, has been promoted to the super league following measurements by hill sleuths Graham Jackson, John Barnard and Myrddyn Phillips. Using high-tech global positioning system equipment, the trio of amateur surveyors spent a day in August getting accurate readings of the height of the mountain, listed by Ordnance Survey as 999m – one metre, or just over 3 feet – short of super-league status. Their four-hour stint taking more than 500 readings from the group of GPS satellites orbiting 22,000km above the earth nailed Glyder Fawr’s height at 1,000.8m – or 3,283ft in old money. The elevation of the mountain into the 1,000m league provides a headache for the Gorphwysfa Club, organisers of the annual Welsh 1,000m Peaks Race. The club will now have to decide whether to include the new ‘super mountain’ in its event. 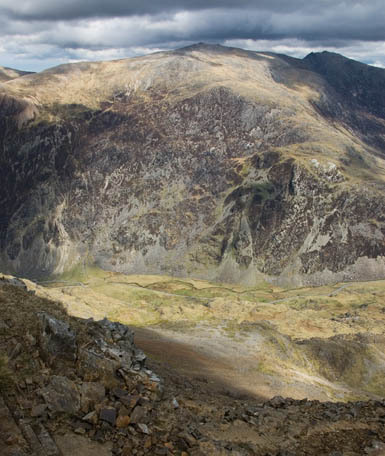 The route, from Aber to Snowdon’s summit, would need a significant diversion to the West to include the new 1,000m peak. The resurvey of Glyder Fawr is the latest for the amateur trio, who now go under the name of G and J Surveys. In June, Tryfan, just 3km (2 miles) from Glyder Fawr, was found to be 917.5m – 2.5m higher than OS maps showed , and allaying fears that the mountain didn’t measure up to the 3,000ft mark. And in September last year, Sgurr nan Ceannaichean was demoted from its munro status by the trio who found its true height to be 913.43m, a metre or so short of the required elevation. “Following closely behind and in the north of the Snowdonia national park are Carnedd Llewelyn (1,064m) and finally Carnedd Dafydd (1,044m). “Does anyone care? Well yes, quite a few people do. For example Wales plays host to many mountain events, one familiar to tourists on the Snowdon Mountain Railway being the Snowdon Race. But, another equally famous is the Welsh 1,000m Peaks Race, where competitors visit all the Welsh 1,000m summits within a given time limit. These international events draw competitors from far and wide. The trio set out to answer the question. “There was only one way to find out if Glyder Fawr is over 1,000m, and that was to go and survey it accurately,” Jackson said. “That is exactly what we did on 16 August. “The weather was favourable and we set off from Ogwen at about 9.30am following the well maintained footpath leading past the side of Llyn Idwal, steeply up the mountain side to pass under the Devil’s Kitchen, and finally out onto the ridge joining Y Garn to Glyder Fawr. “Another 300m slog up the scree-covered mountainside took us to the summit rocks of Glyder Fawr. “This whole area from Glyder Fawr leading to Glyder Fach 1.5km to the East is fascinating to explore, a ‘lunar landscape’ of weird-shaped outcrops set in a sea of shattered rocks. “Once the summit position had been identified using optical equipment, the survey-grade GPS antenna was strapped securely to the side of the summit rock and to be level with the top. The GPS receives signals from the satellite constellation orbiting 22,000km above the earth and from these signals it is able to calculate its position. 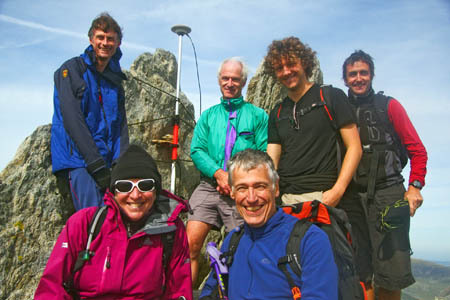 So the instrument was switched on and data recorded for four hours, during which time over 500 individual height readings were collected and this allowed an accurate final result for the height of Glyder Fawr to be calculated. The readings showed the mountain as being one of only five south of the Scottish border – England has none – over the 1,000m mark. Mr Jackson said: “The result has been accepted by Ordnance Survey and the new height will appear on maps in the coming months. “Of course Glyder Fawr is still the same mountain and in that sense nothing changes, but it does have a new status. 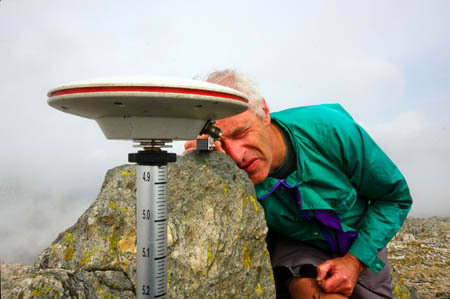 “Perhaps of more importance is the implication of the new height for the fellrunning community. One of the tasks of the Gorphwysfa Club – hence the involvement in the survey of club members Pete and Kate Williams – is the organisation of the Welsh 1,000m Peaks Race. “This event takes in all the 1,000m mountains in Wales. Now the organisers will have to decide how to embrace Wales’s new super mountain. The result was announced at noon today at a press conference at Maentwrog in the Vale of Ffestiniog. Will Welsh peak be promoted to metric super league? The metric system isnt new - it was proposed for the UK as early as 1668! Liz, there's a bit of old change for you! Having been up there many times before I'm curious as to what they measure? An average 'ground' level over a minimum square area or sighting the very tip of the highest point from several points? (there are numerous upward pointing tors projecting from the summit). The surveyors had to determine which was the highest of the two tors on the summit. One was just a fraction higher than the other (by a few millimetres!) this marginally higher tor was used as a marker to align the GPS equipment, as shown in the pictures above. The survey day for Glyder Fawr was quite stunning, with early morning sunshine giving way to swirls of summit mist, this soon dispersed, leaving us bathed in sunshine. Now there's enjoyment for you!!! The term 'amateur' is one often applied, all we can say is that we follow proper procedure and our results are accepted by the Ordnance Survey. Do you honestly think our country's leading authority on mapping would accept mearurement results from 'amateurs'? Nic, "scrutinising" the mountains is not incompatible with enjoying and appreciating them, as I'm sure you would know if you had met any of these surveyors, who are all hill enthusiasts. I think these 1000m peaks should at least be given a decent name, not a silly term such as 'super-mountain,' they should be called the Welsh Arvonians in celebration of the ancient Gwynedd principality of Arvonia. Rog I agree with the idea of a suitable name for the 1000m peaks now the dust has settled. "Super-mountain" was entirely a name invented by us to attract publicity for the work we do. I personally would not use the name but it cetainly helped to attract a lot of media attention. My point is do we really care about exact measurements if as I hope most of us walk the mountains because we love them not because they are classed as super. The height of mountains has been long debated, some early accounts tell us Snowdon was over a mile high. It was left to the early scientists to prove these assumptions wrong. People will always debate the height of a mountain, but I think measuring them has many advantages. It doesnt subtract one's experience of climbing/walking up them. The press conferance announcing the accurate heighting of Glyder Fawr is now available to view on YouTube. To access it just type gandjsurveys in the YouTube search window. Nic, I think everyone who has completed the Munros will have been very interested in the exact height of each and every mountain. Its great that Glyder Fawr is now is 1000m - well done guys for your efforts - I look forward to seeing it printed on the new maps.